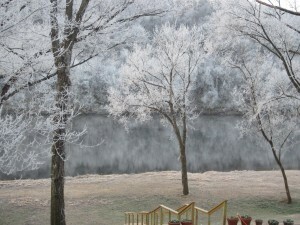 The past few days have been very cold with heavy morning frost. Regardless, Bo’s good friends Bryan and Lydia Dobbins were determined to do a drift boat trip on the White River. Both are well traveled and very accomplished fly fishers. The Dobbins own The Woodsman in Fort Smith, Arkansas, and it is just a wonderful outdoor store. Although the river was dead low we launched at the confluence of the White and Norfork Rivers and made the five mile float to Reds Landing. Although we really did not net a big picture fish Bryan did land a beautiful Brown Trout in the 20 inch range as well a slot Rainbow. However they did catch an impressive number of nice fat Rainbows on RG/PT Cruisers, #16 olive Scuds, #14 brown San Juan Worms, Goins Gold Soft Hackles, #18 black Zebra Midges and a neat little #8 olive Sculpin pattern that Bo ties fished on a 6wt. 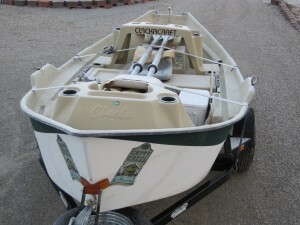 rod and a weight forward floating fly line. 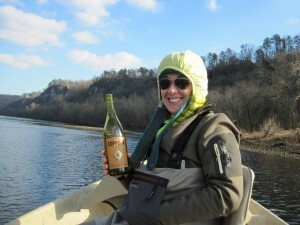 A hearty river lunch and a nice bottle of wine took the winter chill off the day. Perhaps the best part of the day was the fact that we never saw another angler. Wonder why? Don’t forget to stop by The Woodsman for your outdoor clothing and fly fishing gear needs. 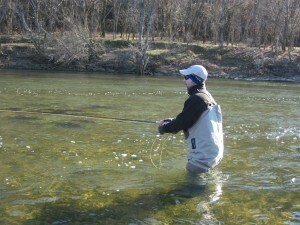 Bryan can help you book a fly fishing trip with us at Empty Creel Fly Fishing Guides and Outfitter.